I'm making a project for a kind of "mod" for a game called Tibia, where I make the world of Middle-Earth from LOTR. Right now I'm using most of their graphics but I want to replace as much as possible so it becomes my own game. Right now I'm doing the more simple things like groundtiles and items, but I hope to learn to make creatures and animations too. I'll try to post new things as soon as I make them! Why bothering in 2014 project-wise with that dead military perspective, which is outdated since several years. It simply leads art and project-wise to nothing good and you have much better options. Because I like the style of those kinds of games and I use existing tools and and game engine/server that is made for this kind of game and perspective. Although since I'm interested in trying to make other kinds of games too I'll try to make other kinds of sprites too. And if I'm not mistaken in Tibia they only make the backside and frontside and then rotate and flip the image to cheat a little bit, not 100% sure but yeah. And they only use 2 animations and 4 directions. But to get back to the sprites, do you have anything to say about the ones I made? I think that’s pretty close minded; why use 'outdated' pixelart This is oblique projection and 45° lines are pretty crisp? There are definitely advantages to this approach too imo, particularly to do with clarity and tiling that I don’t really want to go into but I dunno why this is a issue. I'm a bit tired to give a full crit, sorry, but those rocks are very repetitive in size and shape, almost arranged in rows, the weapons look nice and in style with Ultima... I mean Tibia. Cyangmou, that's like asking: "Why use pixelart in the first place?". I'm really interested which tools/game engine you are using. It might be of use for my will-never-be-done RPG. As for crits. 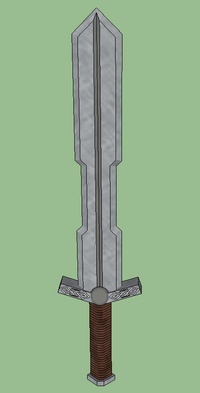 The dwarven sword looks too pillowy, banded even. Try to define the planes with "clusters". Look at those swords you posted as reference! They all have flat/semi-flat surfaces. The Narsil looks OK, but the inner black lines look too strong. If you are about to follow the movie art, you might consider to make the hilt area a bit more slim, otherwise a I would suggest making it a bit more "fancy" - it's a legendary sword. I would also suggest adding some saturation to the metal parts. The tools I'm using are developed for people how want to make their own servers with the Tibia client (their game engine thingy) and graphics, but there is an open source client made by the community on OTLand.net that works the same way but without any copyright issues. Also all the tools I'm using (map editor, server etc) are over at OTLand too. I don't really know what you mean by clusters but I'll do a search for it and try to learn! And I don't really know how I wanted the blade to be. At first I wanted it to be kinda flat and just sharp at the edges, but I don't know if I'm satisfied with that concept. I'll try to edit Narsils hilt, although I think it might become too slim. I don't really know how to make it fancier if I should use the moviesword as a reference, I tried with the hole in the pommel and there should also be a small gold detail there but it might be too small to get in, I'll se if I can do anything about it. Here is an update on Orcrist. I don't intended to make the thread bad or to question what kind of style somebody uses. If one wants to do something, he should go for it. although my concern was: if you have 1000 assets and a single asset takes in average an hour to produce and looks alright or an asset takes with another perspective in average half an hour to produce and looks also alright and maybe a bit less awkward (or just animating it is a lot easier due to the straight axis), then it might be worth to consider a different approach. This question however don't appears here, because we are talking about a Tibia Mod - which wasn't stated initially. Tibia solely supports that perspective and there is no other way and so it's perfectly fine to use it. Here's a start to a cavetroll. Just started a little bit on the legs, do you guys have any suggestions on what could be better? Feedback needed, I need to know if I'm going the right way or learning wrong techniques.